Wij verwelkomen u graag in de brasserie van de Zwarte Boer! 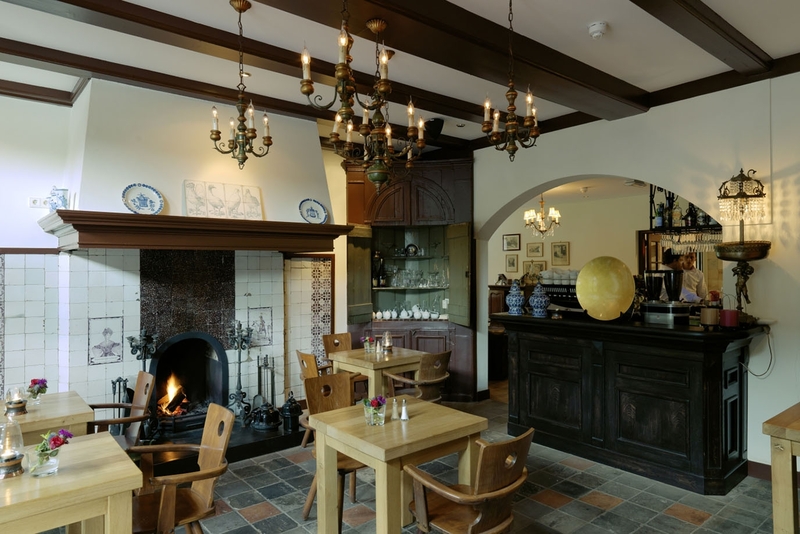 In the oldest part of Hotel-Restaurant "De Zwarte Boer" we bid you welcome for a cup of coffee with homemade pastries, a tasty lunch from our lunch menu or a tantalising dinner. "De Gelagkamer" dates from the early years of the 17th century. Enjoy a crackling fire in our beautiful fireplace with original tile tableau of King William II and his wife Anna Paulowna. During the extensive restoration we found the original floor which was hidden under a wooden layer and carpet. The floor has now been fully restored. The former kitchen has become part of our bistro. In 2015, we gave this part a makeover. Here we present the wines of our own label on perfect temperature out of the beautiful climate controlled wine fridge. Here you also find the old wooden stove with gorgeous tile tableau. One of the many lost treasures of the 'Old House Leuvenum ". The old wardrobe and bedstead, date from the time when only the wealthy coachmen could afford an overnight stay. Did you know that the bedstead was not so small because the people were once much shorter? They slept half sitting because they feared that the blood would rise to their head. For all your reservations and additional enquiries, please don't hestitate to call us direct at +31 577 407395. Restaurant opening times	Opening hours seven days a week starting from 10:30hrs for coffee with home-made pie.